Fitness by Chris Finley: More Information Than Ever yet Less Results? If personal trainers, PhDs of Nutrition, and dietitians can get caught up in this nearly useless information, what is someone who has never studied and trusts the magazines and the "low carb guru" suppose to do? Granted, the personal trainers, PhDs, and dietitians can sort through the information and come back to the basics that matter, but most people will be swept away in Acai Berries, or no carb junk, or what have you. This is a call to STOP looking at magazines. If you enjoy learning new tricks and you have the basics down then fine, but if you are struggling with losing any weight please do NOT read the magazines and fad books. Learn the basics. 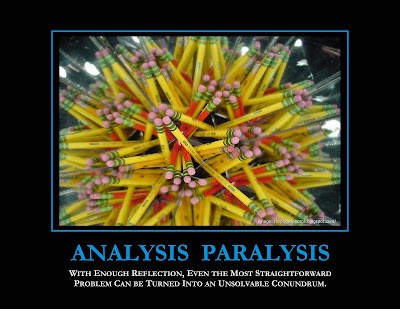 People learn so much they get "analysis paralysis." You're better off focusing on veggies, lean protein, and some fruit along with a few other basic habits then you are trying to stay up to date. The human body has not changed. Physiology has not changed. Our "food," habits, and mind sets have changed. Most people know what it takes. Eat less, move more, get your veggies. If you aren't losing weight, you're eating too many calories and/or not moving enough. It's that simple. Stop studying, start DOING! And get an accountability partner or two. You'll be glad you did. Not to mention your stress levels will drop because you aren't being confused by "gurus" and "experts." You're better off doing something mediocre that is based on solid common sense than you are not doing the most advanced, science-based program. If you enjoy this blog please spread the word. You could have a hand in changing someone's life!